It doesn’t seem to matter where you’re coming from. Once you leave the freeway, it’s a long drive to Serpent Mound on miles and miles of twisting roads. But the weather was nice, the scenery beautiful, and Mapquest’s estimate pretty dead on. We arrived at 10:15 AM. We entered the Visitor’s Center and watched a short movie which gave a nice history and overview of the monument. There are some interesting exhibits inside, as well as small gift shop. Back outside, we climbed a viewing tower, which overlooked the serpent and allowed us to see the entire form all at once. The tower was not for the faint of heart. It was sturdy enough I guess, made of steel bars with wood slats on the floor. Something about it was a bit unnerving, the rattling tremor you get under foot with those sorts of steel structures, no doubt. But nevertheless, climb we did, first to one platform and then on up to the next. Three-foot high and 1348 feet long, the oval head of the serpent aligns to the summer solstice. The serpent’s coils align to two solstice and two equinox events each year with curves in the serpent’s body aligning to lunar events. Who built the mound has been a long debated question. The latest evidence suggests it was built by the Fort Ancient Culture around 1070 CE. But this continues to be debated so heavily that I’m sure the story has probably changed the moment we left. As we walked around the mound along a paved trail, we argued over what scientists have argued about for years – whether the oval at the tip is the serpent’s head or an egg being swallowed by the serpent’s open mouth. My family was split, with half of us seeing a head and the other (wrong) half of us seeing an egg. You know where I stand. Along the trail, we came to vantage points which allowed us to see how the effigy is built on a high bluff. 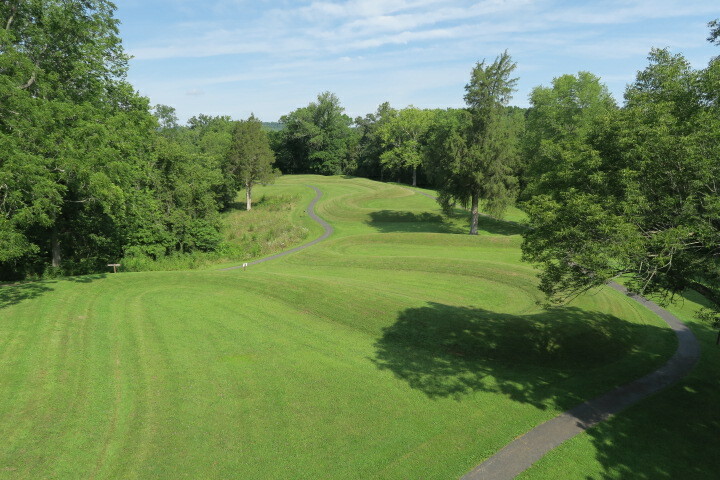 Although I had visited Serpent Mound twice before, I had never realized this because I had never walked around the mound and the bluff isn’t visible from the ground. You only see it if you walk to the edges and look over the railings. My family’s review of Serpent Mound was mixed. The history buffs, including my oldest grandson, loved the place. The non-history buff, including my youngest grandson who wanted to know why we had driven so far to look at a grass covered hill, well, not so much. He was a good sport and indulged the rest of us, and since it wasn’t a long stop he managed to survive. Including our time in the museum and the walk around the mound, the visit took us less than two hours. An hour to the northeast we found Chillicothe’s highest rated restaurant, a place called Carl’s Townhouse. I’m not sure why Carl’s was the “rated #1 out of 75 restaurants in Chillicothe” on Trip advisor.com. Yes, the decor was kind of cool with a, 50s, 60s style lunch counter. And the food and service were good. But the menu had things like a cheeseburger basket, grilled cheese, BLTs, fried bologna, etc.,– all sandwiches, making it a good place for lunch, but probably not what most people would consider dinner. Milkshakes seemed to be their specialty. They were served in a Styrofoam cup instead of the retro glass I expected– not that that really matters. I have no complaints about the place. But I still don’t quite understand the #1 rating. It’s just sandwiches. Surely “out of 75 restaurants in Chillicothe” there must be something better than a cheeseburger or fried bologna sandwich. 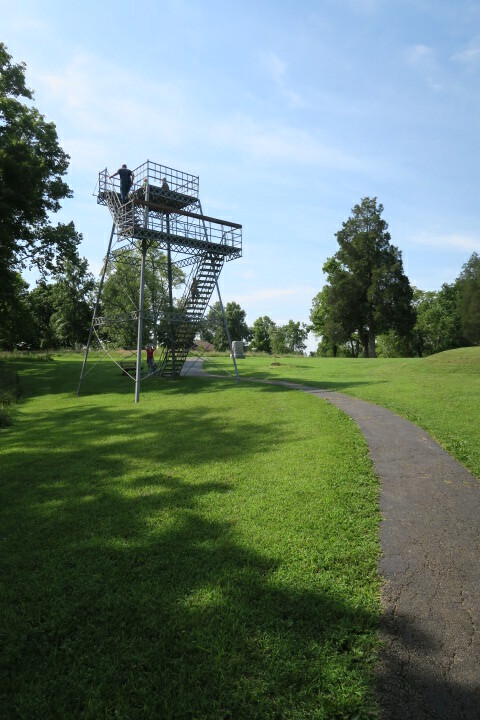 What used to be called Mound City is now the Hopewell Culture National Historic Park and it’s operated by the National Parks Service. Again, our first stop was at the Visitor’s Center to watch a short movie. The gift shop here is a good place to buy history books about the mound builders. I bought a nice, general field guide that has been newly published and which contains information and pictures about Eastern wildflowers, wild animals, trees, rocks, etc. The Ranger said they were excited to have just gotten it in stock. I bought one of the last copies. We walked across the site and around the mounds which are plentiful. 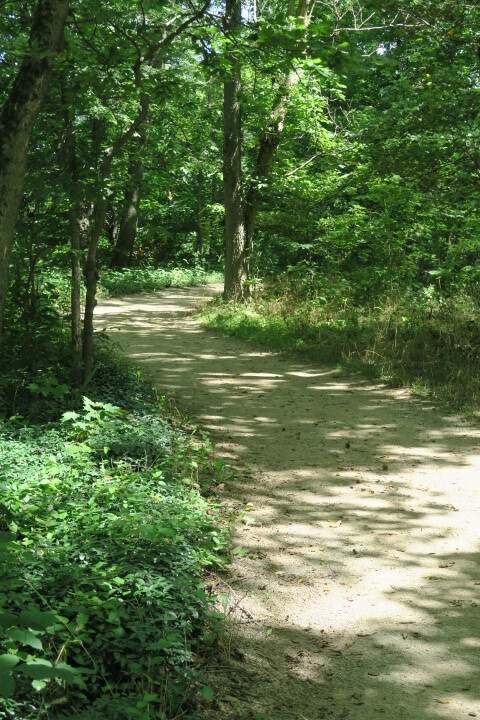 A couple of short hiking paths lead through the woods and along the river. We followed the shaded trails which led nowhere really, except back to the parking lot. 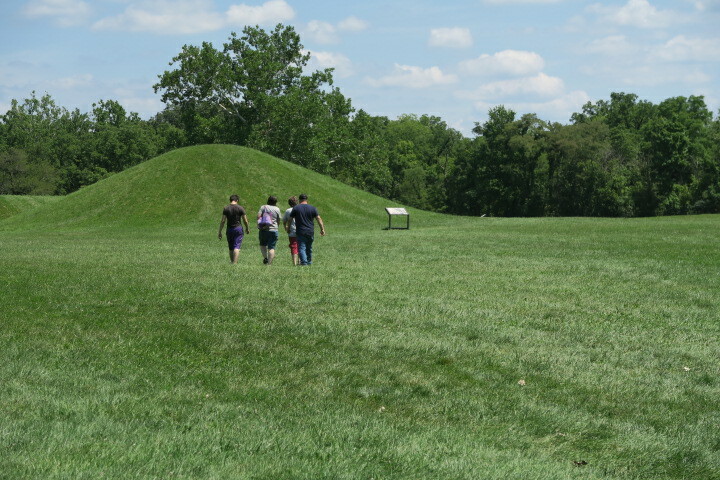 If if we had timed it right we would’ve been able to catch the 3 PM guided mounds tour. I always find the National Parks guided tours fun and interesting. But the day was very hot and we had two boys anxious to find a hotel swimming pool. Soafter an hour of walking around the site, we allowed the guided tour to start without us and we headed off to find the Holiday Inn Express.